Aug 08, 2017: The next Youth Day will take place in India in 2020, the second time the South Asian nation will be hosting the continental-level Catholic Church event since 2003.
at the end of the concluding Mass of the 7th Asian Youth Day (AYD7), which he presided over in Yogyakarta, Indonesia. 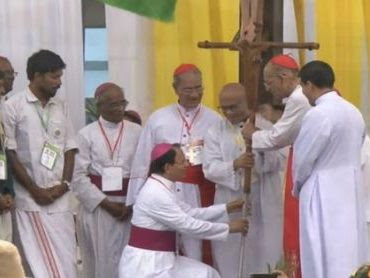 Cardinal Gracias, Archbishop of Bombay, together with Indian Church officials and some of the Indian youth delegation received the simple bamboo AYD cross from their Indonesian counterparts for the next AYD to take place in 3 years’ time. Among those who flanked Cardinal Gracias, the main celebrant, at the altar were Filipino Cardinal Luis Antonio Tagle of Manila and Archbishop Ignatius Suharyo of Jakarta, who delivered the homily in Bahasa Indonesia. “We do realize our differences: We are of different nationalities, different languages, different cultures, and so on,” noted the archbishop who is president of Indonesia’s bishops’ conference (KWI). “However, in this event, we do realize and experience that those differences cannot separate us, but the differences show the richness of the united humanity instead. It proves that the power of faith, hope and love unites us.” Arch Suharyo wished that the AYD7 help the young people to “diligently and faithfully live out the Gospel so that we may be filled with the joy of the Gospel.” “Thus, our life could mirror the glory of the Lord, which changes our lives,” he said. The Asian Youth Day in Indonesia, on the theme, “Joyful Asian Youth! Living The Gospel in Multicultural Asia,” was divided into three phases. It began with over 2000 participants from 21 Asian countries living with local families in the country’s 11 dioceses, July 30-August 2. The delegates then converged in Yogyakarta, Indonesia’s cultural and intellectual heartland, for the main event, Aug. 2-6, which concluded on Sunday with a Mass, marked by a rich display of cultural diversity that both Indonesia and Asia are famous for. This was evident in the flags, including of the Vatican, traditional and ethnic costumes, decoration, singing, music and dancing accompanied by traditional musical and percussion instruments, both during and after the final Mass. While the young people headed back home, the youth animators and ministers remained behind for the final phase of the AYD7 – the Asian Youth Ministers’ Meeting (AYMM) in Yogyakarta, Aug. 6-9. Among the participants in the AYD7 were 52 bishops 6 cardinals, 158 priests and 41 men and women religious. Among Asia’s prominent Catholic leaders at the meet were Cardinal Gracias, the president of the Federation of Asian Bishops’ Conferences (FABC) and member of the Pope’s “C9” council of cardinal advisers, Bangladeshi Card. Patrick D’Rozario of Dhaka, the chairman of FABC’s Office of Laity and Family, under which comes the Youth Desk that organizes the AYDs in collaboration with the host bishops’ conference, and Card. Tagle, the president of Caritas Internationalis, the federation of national Catholic charity organizations worldwide. Held for the first time in Hua Hin, Thailand, in 1999, AYDs have been held in intervals of 2, 3 ‎and 5 years. Taipei, Taiwan hosted it in 2001, followed by Bangalore, India in 2003, Hong Kong in 2006, Imus, the Philippines in 2009 and Daejeon, South Korea, in 2014, which Pope Francis attended.